Is The Braun Coffee Grinder the Key to the Ultimate Cup? Home Brands Is This Braun Coffee Grinder the Key to the Ultimate Cup? Is This Braun Coffee Grinder the Key to the Ultimate Cup? If burr grinding is best, then why is the Braun coffee grinder so popular? If you are looking for the ideal coffee experience, a Braun coffee grinder is one way to step up your morning cup. Ask any coffee aficionado about the best way to taste the nuanced flavors and aromas of the beverage, and they will most likely include freshly ground beans as a critical step. Grinding your own coffee may seem like a chore. You need to buy whole beans, store them properly, then figure out the right coarseness for your coffee maker. All these steps are actually quite easy, and if you enjoy coffee, you'll love the brewing results with fresh grounds. When you invest in a coffee grinder, you'll never look back to your old, stale coffee drinking days. Why is freshly-ground coffee superior to coffee ground weeks, if not months ago? It's all about the integrity of the coffee bean and how grinding can quickly cause flavor opportunities to vanish. The effect is similar in black pepper. Imagine the taste of fresh ground pepper. It tingles the tongue. The flavor is deep and complex. Now think about the preground stuff that is in the tiny paper packets at a fast food spot. Does that pepper even taste like anything? A Braun coffee grinder can help you experience robust and complex flavor in your morning coffee. By waiting until the last minute to break into a coffee bean, aromas and tastes stay in your cup instead of wafting away in the air. Fresh coffee beans make for a better tasting end product. Once coffee beans are roasted, they begin to lose some of their volatile compounds. These are the chemical parts of a coffee bean that contribute to complex flavors. Grinding a coffee bean speeds up the evaporation of these aroma and flavor compounds. In other words, once you grind coffee, it starts a trip down the road leading away from flavor town. Coffee pricing can seem odd at first. Often, whole beans are more expensive than pre-ground coffee. One would think the closer you get to a raw product, the cheaper it would be, but there are a few reasons why this is not the case. First, most coffee is ground because of consumer demand. Mass produced coffee is ground immediately before packaging to seal in flavor, and the producers absorb the cost for this part of production into operations. The second reason that whole beans are often more expensive is that companies market unground coffee to customers with discerning tastes. The whole bean varieties are usually exotic or unique. In other words, cheaper beans are often used for pre-ground coffee. So, while your coffee beans may cost slightly more, you can rest assured that this is because you are about to embark on the best coffee experience possible. Of course, grinding coffee beans at home requires an additional equipment expense. As with most small appliances, there are numerous types of grinders with different features and options. The price for a coffee grinder ranges from $10 to $300. Quality exists at each end of the price spectrum. While all coffee grinders essentially perform the same task, there are two general types of machines marketed to consumers. One is simple and less expensive, while the other uses more complicated construction to achieve uniform grind coarseness. A blade grinder is the most simple coffee bean grinder, and until recently, was the only type of coffee grinder available to consumers. These grinders operate like a small blender. A flat blade quickly spins in a small chamber, pulverizing coffee beans into smaller particles. Blade grinders are often a less expensive option, but some believe that they do not create uniform grinds. The reason for this is that the beans remain in the grinding chamber for the whole process. With ground coffee mixing with whole beans that have yet to come in contact with the blade, the result can be a mixture of coarse and fine grounds. Grind consistency is possible by processing smaller amounts of coffee at a time. Burr grinders are closer to professional grade. That upside down hopper of beans atop your favorite barista's espresso machine is likely a burr grinder. These work more like a grain mill, with abrasive discs rotating together to pulverize the coffee uniformly. Once ground, the coffee drops to a separate chamber, eliminating the possibility of over grinding. These uniform results come with a hefty price tag, though. While burr grinders create a more precise texture, they are much larger than many blade grinders. A blade coffee grinder is a simple and portable kitchen tool. You just fill the top with your desired quantity of coffee and then pulse for 15-20 seconds. With a Burr grinder, you fill the hopper with beans, dial in the coarseness level, turn the grinder on and wait for your coffee grounds to dispense. In the time it takes to run the burr grinder, you'd likely have the small blade grinder wiped out and placed back in your cabinet. Also, as a non-coffee benefit, many people use a blade grinder for spices and nuts. These grinders are perfect for grinding your own toasted spices. An inexpensive blade grinder can be earmarked just for spices unless curry-laced coffee is your thing. Do not attempt to grind spices in your burr grinder, as the grinding wheels are inaccessible for cleaning. Many blade grinders are less expensive options, but this is not always the case. The Braun coffee grinder that we chose to spotlight is a simple appliance that has its own wide-ranging value depending on supply. It has enduring popularity and can be difficult to locate. Here are all the details on the Braun coffee grinder, with a comparison to other products. This classic Braun coffee grinder is a blade-type machine that has been in production for decades. There are other brands with similar features, but this Braun coffee grinder has an almost cult-like following. Let's take a closer look at this appliance to see what all the fuss is about. To rate the Braun coffee grinder, we looked at features, ease of use, and cost. Then, we listened to the long list of customer reviews, both positive and negative. The Braun KSM2 coffee grinder is a simple blade grinder. 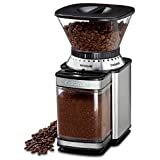 Like most other blade-type coffee and spice grinders, you simply add your desired quantity of whole beans (or spices) to the top, grind for a bit to the desired consistency and dump the grounds into your coffee maker or another brewing vessel. The blade design couldn't be more basic. It is essentially a flat thin bar of metal, designed to make quick work of a coffee bean, without turning it into dust. It can accommodate enough beans for a 12-cup pot, but grinding that much coffee at once is almost certain to result in some over-processed, powdery grinds. If you are brewing this amount, which requires about 3/4 of a cup of ground coffee, break the task up into two batches. The lid doubles as a measuring cup, so you don't have to get involved with any guesswork. Just remember to measure coffee after it is ground if you are brewing based on volume. Braun's 150-watt motor powers through ingredients efficiently, so even with a two-step process, you'll be enjoying your coffee quickly. This is where the cult-status of the Braun coffee grinder gets interesting. When the product first hit the shelves, you could often buy one for less than 50 dollars. Now, while they are still available, the price range is much higher. The reason for this difference? Braun seemingly is no longer manufacturing the blade coffee grinder, but there are many available online. Customers rave about the Braun coffee grinder. The only complaints are that the company no longer produces the appliance, so finding one can be difficult. Most reviews marvel at the durability, with many stating that they made their recent purchase as a gift, a backup, or for use as a dedicated spice grinder. Since availability is limited, we decided to compare the Braun coffee grinder with others on the market. While you might want to invest in the Braun grinder, several choices may be cheaper and as useful. We looked at a bargain choice, a grinder most similar to the Braun, and a reasonably priced burr grinder for those wondering how the revered Braun matches up. Maybe one of these will be the next coffee grinder to attain elusive status. The first comparison is as close as you can get to the Braun coffee grinder. The design of the Krups electric coffee grinder is almost identical to Braun, so if you are looking for an easier route to the simplicity of a blade grinder, the Krups might be a good choice. The machine works in the same way, has the same grind capacity and stainless-steel blade system. The power switch is lid-activated so that you can pulse your beans to oblivion in just a few seconds. It has an oval grinding chamber design, which helps avoid over grinding and ensures consistent results. The Krups electric coffee grinder is highly-rated by customers, with thousands of reviews. Many like the quick grinding action, with most saying that it only takes a few seconds to grind up enough for your pot of coffee. Some point to a lack of durability, which might be acceptable if you only use the grinder occasionally for spices. 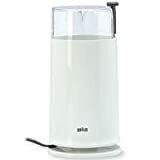 The Krups electric coffee grinder is inexpensive, at this price and high ratings, you can forgive Krups for not manufacturing a product that can last as long as a Braun coffee grinder. Featuring a similar form factor as both the Braun coffee grinder and the Krups model, Mueller's grinder might be the best electric blade grinder on the market today. Just make sure you only use it for coffee, per the manufacturer's warning. With a removable lid that also is the on/off button and measuring cup, Mueller's grinder is even more straightforward to use than others on the market. Like any blade grinder, achieving the perfect degree of coarseness takes a little bit of practice. Though it is a small and portable grinder, it has a heft that suggests it's built to last. Positive customer reviews note how quickly and quietly the Mueller grinds coffee beans. Users also commented on how easy cleanup is with this grinder. The few negative comments note that it's not intended for spices, which limits its utility. Others indicate that the grinder does a less than perfect job in creating fine-ground coffee, such as would be used in preparing espresso. The Mueller grinder is slightly more expensive than the Krups model. It is much cheaper than the cost of the Braun coffee grinder, though. A final coffee grinder to consider is an entirely different coffee grinding animal. The Cuisinart DBM-8 is a burr grinder. Unlike the Braun coffee grinder and the other comparisons, this model pulverizes coffee beans evenly and allows users to dial in the grind level. There is a separate bean hopper and grind chamber. You merely set the grind to anywhere between fine and coarse with a simple rotating dial, then press the power bar until you've ground enough coffee. The Cuisinart grinder has an eight-ounce bean hopper, which is an ideal amount for most purposes. Adding more risks using the hopper as storage for your beans, which is not the best way to keep your coffee fresh. The grinder comes with a standard coffee scoop and a cleaning brush, both of which are helpful tools that the blade grinders omit. Most notably, however, the burr grinder creates superior coffee grounds. Although a burr grinder is a better grinder in general, not all customers are enamored with the Cuisinart model. While there are thousands of reviews, and most of these are positive, many reviewers note that this grinder can get a lot messier that simple blade grinders. This may have more to do with how burr grinders work than anything. While burr grinders can get expensive — and customer shower many of the pricier models with glowing reviews — the Cuisinart DBM-8 is inexpensive. For a little more than the Krups and about the same price as the Mueller, you can experience burr grinding for your home coffee. The Braun coffee grinder is a quality product with many fans. However, it's best to move on to an alternative when the manufacturer shuts down production. We think the Mueller electric grinder comes closest to the quality and performance of the Braun coffee grinder. For greater control over grind quality, the Cuisinart DBM-8 is the best overall option. Burr grinding may require a little more cleanup and may be less portable than a blade model, but if you are going to commit to a better cup of coffee, put away the spice grinder and graduate to a quality machine. Previous articleBurr Coffee Grinder: Are They Really the Best of the Best? Next articleIs the Best Coffee Grinder a Blade or Burr? Is the Best Coffee Grinder a Blade or Burr? Burr Coffee Grinder: Are They Really the Best of the Best?